Low Maintenance. 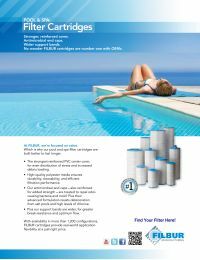 Cleanable & reusable, the FC-0359M Spa Filter Cartridge requires fewer filter replacements, resulting in less hassle and maintenance. Premium Polyester Filter Media. Polyester with Microban technology provides clearer, cleaner water. Microban Antimicrobial Technology. Microban prevents harmful bacteria from growing on the cartridge reducing foul odors, algae, black mold and other contaminants. Our pool and spa filters are made to meet or exceed OEM filters. For help selecting the right filter for your pool or spa, call us at 1-877-335-3339. Our water experts will be glad to help you.